There are many cool and unique open tunings for your guitar playing that will open up all sorts of possibilities that just aren’t available to you in standard tuning. Open G tuning is one of these, and today we are going to take a close up look at chords in this tuning. Before you decide that playing in open tunings sounds too hard, and that playing in standard is challenging enough, just understand that open tunings are created to make things EASIER to play, NOT harder. If you can play guitar to a reasonable standard, then you can most definitely be sounding great in a tuning like open G immediately! I will prove this to you today by showing you how easy it is, and how cool you can sound right away playing chords in an open G tuning on your guitar. Before we do however, let’s first take a little bit of a closer look at open g tuning. Despite it’s popularity and association with the blues, this tuning can be traced back as far as 1830 to a piece called “Spanish Fandango”, and is why it is sometimes referred to as “spanish tuning”. It falls into the category of “open” tunings, where some of the open strings of the guitar are tuned to different notes to create a particular chord when strumming them together. As you can see, to achieve an open g tuning, you simply change the 6th, 5th, and 1st strings of your guitar to a D, G, and D note respectively. The 4th, 3rd, and 2nd strings remain unchanged. Strumming all open strings together now gives you a G major chord. There was a time when I would avoid anything that was in an open tuning like the plague. I had a false premise that open tunings were difficult to play in, changing the way I had come to know and visualise the fretboard. To me, I thought it would be like starting the guitar all over again and certainly not something I wanted to do. How wrong I was, and how much I missed out on because of, HOW WRONG I WAS! Don’t make the same mistake I did, open tunings are not only fun to play in, they are easy to play in too, as I am about to show you. You will see, like I did, that you can sound great straight away in an open g tuning, even with just entry level guitar skills. The following are 3 ways you can create with chords in an open g tuning on your guitar. There are many more, however these will give you a great head start into the wonderful world of open tunings. Learn them well, and then use these ideas to come up with your own creations and variations. 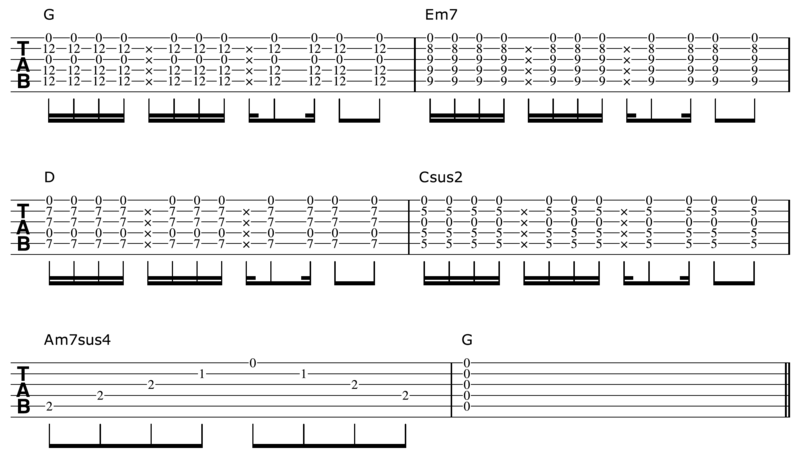 This is essential to do to really make open g tuning part of your guitar playing. The great thing about open tunings is that if you can sound a chord right off the bat by simply strumming the open strings of your guitar, then this holds true for when you bar a single fret. So instead of needing the majority, if not all of your fingers, plus 3 frets to play a bar chord, you now only need 1 finger and 1 fret. The chords above derive their name from the root note on the 5th string. Due to our tuning we only need our index finger to bar a single fret to sound them, resulting in the remaining fingers being free to add extensions and embellishments. A great feature of any open tuning is the drone you get of the open strings, which you can in turn utilise in your playing. The consistency of the open string drone and the various ways they relate to the fretted notes of each chord is what makes this progressions and others like it sound so cool and unique. Let’s stick with the drone of the open strings and integrate this approach with a very common harmony used on the guitar known as 6th’s. The great thing here is if you are already familiar with how 6th’s look on the fretboard from a visual point of view, then nothing changes in the open g tuning. This is because we’re going to play this harmony on the 2nd and 4th strings, which remain unchanged in this tuning. Feel free to strum the above example with any kind of pattern or time/tempo you like. Be sure to hold each 6th harmony shape (ie. the fretted notes) of each position down at the same time so that all the notes ring throughout.